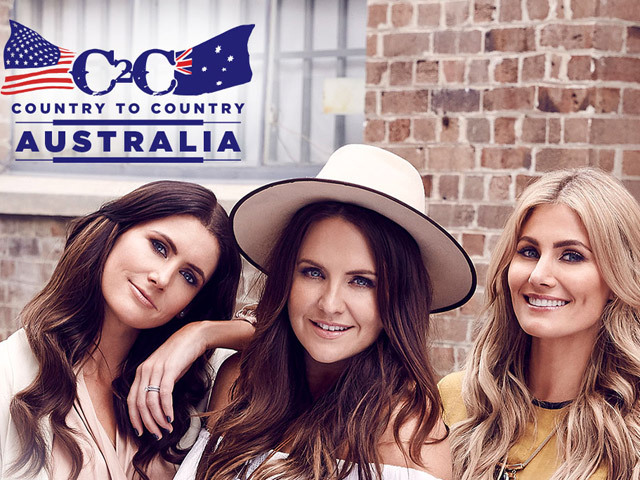 Alabama native Drake White will return to Australia for C2C – this will be his 2nd visit to Australian shores. Immediately shooting to No. 1 on the iTunes Top Country Albums chart upon release, White's debut album 'SPARK' has earned praise both commercially and across his loyal following. The undeniable sound of his soulful voice has whipped concert audiences into a frenzy as Drake and his band, The Big Fire, raise the roof and summon spirits to life onstage. It's equal parts Baptist tent revival and amped-up southern rock festival. White, along with his band The Big Fire, have toured with superstars including Willie Nelson, Dierks Bentley, Little Big Town, Zac Brown Band, Eric Church and Toby Keith. Since the release of their debut EP in 2006, sisters Brooke, Sam & Mollie McClymont - The McClymonts - have established themselves as Australia's number one country group with over a quarter of a million album sales, two gold album sales accreditations, twenty-two chart-topping singles and a reputation for being one of the most exciting touring acts in country music. They are thirteen-time Golden Guitar Award winners including the 2018 'Album of the Year' for their best-selling album 'Endless' (which went #1 on the ARIA country album chart). They have also won two ARIA Awards, an APRA Award, three Country Music Channel Awards and a CMA 'Global Artist of the Year'. Travis Collins is a seven-time Golden Guitar winner and a true Australian country music superstar. With a growing string of hit albums, #1 songs, awards and a decade of winning fans all across the country under his belt, he continues to cement his footprint as a mainstay on the Australian music landscape. Collins is as well-known for his masterful guitar playing and powerhouse vocals as he is for his depth of song-writing and high energy live performances. His sixth studio album 'Brave and the Broken' is out now. Andrew Swift won two Golden Guitars in 2019 for Alt Country Album of the Year and New Talent of the Year. His album 'Call Out For The Cavalry' unleashed 4 singles, including 'Reckless Desires', 'Runaway Train' (one of 2018's most played singles on Australian country radio), 'King of the Sky', and the latest (and Golden Guitar nominated for Vocal Collaboration of the Year), 'Fire & Ice' featuring Catherine Britt, which climbed the radio and video charts since its release in November 2018, reaching #2 on Kix Country and #1 on the Country Music Channel (Australia) video chart in March 2019. Judah Kelly won the 2017 season of The Voice Australia. Music has always been part of Judah's life, from performing in front of family in a New Zealand church at the age of four to three stints at Tamworth's Academy of Country Music and a number of years spent working for others as a live and studio guitarist and bass player. His second album 'Real Good Time' is out now. Nashville duo Reverie Lane will make their first Australian debut at C2C. Coming together in 2014, singer-songwriters Spencer Bartoletti and Presley Tucker have achieved some impressive milestones which many musicians can only dream of, including performing on stage at The Grand Ole Opry and the Ryman Auditorium alongside Presley's mother, country music icon and legend, Tanya Tucker. Australian Sinead Burgess makes a welcome return to the country music scene and her first festival appearance since the release of her album 'Damaged Goods'. Check the website https://www.c2c-countrytocountry.com.au/ for artist line-up and further announcements.